Funding This study was funded by the CONNY-MAEVA Charitable Foundation and INSERM. The funding sources had no role in the design and conduct of the study, collection, management, analysis and interpretation of the data. Increasing number of patients are treated with direct oral anticoagulants (DOAC). An antidote for dabigatran inhibiting thrombin (idarucizumab) is available but no antidote is yet approved for the factor Xa (FXa) inhibitors (xabans). We hypothesized that a complex between Gla-domainless FXa and α2-macroglobulin (GDFXa-α2M) may neutralize the xabans without interfering with normal blood coagulation. Purified α2M was incubated with GDFXa to form GDFXa-α2M. Affinity of apixaban and rivaroxaban for GDFXa-α2M was only slightly decreased compared to FXa. Efficacy and harmlessness of GDFXa-α2M were tested in vitro and in vivo. Stoichiometric excess of GDFXa-α2M neutralized rivaroxaban and apixaban as attested by clot waveform assay and rotational thromboelastometry, whereas GDFXa-α2M alone had no effect on these assays. Efficacy and pro-thrombotic potential of GDFXa-α2M were also assessed in vivo. Half-life of GDFXa-α2M in C57BL6 mice was 4.9 ± 1.1 minutes, but a 0.5 mg/mouse dose resulted in uptake saturation such that 50% persistence was still observed after 170 minutes. Single administration of GDFXa-α2M significantly decreased the rivaroxaban-induced bleeding time (p < 0.001) and blood loss (p < 0.01). GDFXa-α2M did not increase D-dimer or thrombin–antithrombin complex formation, suggesting a lack of pro-thrombotic potential. GDFXa-α2M is therefore an attractive candidate for xaban neutralization neither pro- nor anticoagulant in vitro as well as in vivo. Following decades of vitamin K antagonist prescription as unique oral anticoagulant bridging therapy with heparin or its low molecular weight (MW) derivatives, direct oral anticoagulants (DOACs) have been developed targeting thrombin (dabigatran) or coagulation factor Xa (FXa; xabans). As prescriptions expand, experience underlines that bleeding complications also occur with DOAC. This is specially threatening in the absence of available antidote or reversal agent in clinical scenarios such as massive haemorrhage, trauma, stroke requiring thrombolysis or urgent surgery. Effective specific antidotes are available for vitamin K antagonists, heparin and partially for its low MW derivatives. An antidote for dabigatran had been approved which consists in a humanized monoclonal Fab (idarucizumab) that can be used in case of severe active bleeding and emergency surgery or invasive procedure. Xabans still lack approved antidote. Pro-haemostatic agents (prothrombin complex concentrate activated or not) increase thrombosis risk, thus their use is currently restricted to life-threatening situations. Andexanet-α is the most advanced candidate as antidote to xabans. It is a modified FXa lacking its Gla domain that had been inactivated by a S195A mutation. Andexanet-α efficiently binds FXa inhibitors and does not activate prothrombin nor consume antithrombin albeit still forms a low affinity Michaelis complex with the serpin. ANNEXA-4 clinical trial is currently in progress to confirm its efficacy and safety. Ciraparantag is a small cationic compound antagonizing DOAC as well as heparin and derivatives. Little data are yet available on this molecule which is currently in phase II trial. Besides antidotes, potent by-passing agents are also in the pipeline, such as the I16L FX variant, acting as a zymogen-like acquiring prothrombin activator potential through factor Va binding, or the DOAC resisting 99-loop FX variant. Their key advantage resides in the limited amount needed to correct DOAC-induced bleeding, in contrast to stoichiometric lure or bait antidotes. We hypothesized that Gla-domainless FXa (GDFXa) sequestered by α2-macroglobulin (GDFXa-α2M) would be prevented from interacting with pro- as well as anticoagulant macromolecules (factor Va, prothrombin, antithrombin and tissue factor pathway inhibitor [TFPI]), whereas its active site remaining functional still binds xabans. Alpha2M is a broad-spectrum molecular trap inhibitor   mainly targeting thrombin, FXa and plasmin in blood. Native α2M is a homotetrameric glycoprotein (MW 720 kDa; plasma concentration, 3.5 µM in adults). Each sub-unit includes a bait region targeted by numerous proteases and a cysteinyl-glutamyl thiol ester bond. Cleavage induces a major conformational change trapping the protease within a cage-like quaternary structure. Native α2M and α2M that had reacted with a protease have markedly different shapes, the latter having a paradoxical enhanced mobility (fast form) in native gel electrophoresis. Cleavage also unmasks the γ-glutamyl groups which react with NH2 ε-lysyl group of the protease covalently linking the entrapped protease. Steric hindrance prevents macromolecules to interact with the entrapped protease, which nevertheless still cleaves small peptidyl substrates and is neutralized by peptidyl chloromethyl ketone. Thus, it was reasonable to expect that entrapped GDFXa would still bind DOAC inhibiting FXa. We prepared GDFXa-α2M complex and assessed its potential regarding xabans neutralization in vitro in platelet-poor plasma (PPP) and whole blood as well as in vivo in a pre-clinical bleeding model. Blood was collected by venipuncture (0.105 M buffered trisodium citrate 9/1 v/v) from healthy volunteers who gave their written informed consent (Etablissement Français du Sang, Paris, France; convention C CPSL UNT n°13/EFS/064). Pooled normal PPP was purchased from Cryopep (Montpellier, France). Apixaban and rivaroxaban were kindly provided by Bristol-Myers Squibb/Pfizer (Princeton, New Jersey, United States) and Bayer Healthcare AG (Leverkusen, Germany), respectively. About 4 mg apixaban or rivaroxaban were dissolved in dimethyl sulfoxide (DMSO). Just prior to use, rivaroxaban was rapidly diluted at 1/100 in H2O and further diluted in 50 mM Tris-HCl pH 7.5 containing 0.15 M NaCl (tris-buffered saline [TBS]) and 1% DMSO. Dilutions were performed directly in TBS containing 1% DMSO for apixaban. Effective (final) concentrations of xabans were measured in PPP by anti-Xa activity on a STA-R and a set of specific calibrators (Stago, Asnières, France). For in vivo studies, pills of rivaroxaban (Xarelto, Bayer) were dissolved in 10 mM HCL (vehicle) and used to force-feed mice at the indicated dose. Enoxaparin (Lovenox) was purchased from Sanofi Aventis (Gentilly, France) and fondaparinux (Arixtra) from Aspen (Marly-le-Roi, France). Dilutions were performed in TBS. Human GDFXa expressed in bacteria was purchased from Cambridge ProteinWorks (Cambridge, UK). Antithrombin was purchased from LFB (Aclotine, Courtaboeuf, France), TFPI from American Diagnostica (Greenwich, Connecticut, United States), recombinant human tissue factor (TF) from Dade Behring (Innovin, Marburg, Germany) and aprotinin from Nordic Group Pharmaceuticals (Paris, France). Phospholipid vesicles were prepared by sonication (2 minutes in pulse mode 0.15/s, 80 W, 4°C) of a 1 mg/mL mixture of L-α-phosphatidylcholine (66%, w/w) with L-α-phosphatidylserine (33%, w/w), both from Avanti Polar Lipids (Alabaster, Alabama, United States) as previously described. Chromogenic substrate N-α-benzyloxycarbonyl-d-Arg-Gly-Arg-pNA (S2765) and the inhibitors D-Phe-Pro-Arg-chloromethyl ketone (PPACK) were purchased from Cryopep, phenylmethylsulfonyl fluoride (PMSF) and methylamine (40% solution) from Sigma Aldrich (Steinheim, Germany). 1,5 Dansyl-Glu-Gly-Arg chloromethyl ketone (DEGRck) was purchased from Merck KGaA (Darmstadt, Germany). Human α2M was purified according to published protocols. Briefly, a cocktail of inhibitors (1 µM PPACK, 2 mM PMSF, 2 mM ethylenediaminetetraacetic acid (EDTA) and 100 KIU/mL aprotinin) was added to freshly thawed frozen plasma. Plasminogen was removed by chromatography on Lysine-Sepharose 4B and vitamin K-dependent factors by 80 mM barium chloride precipitation and the bulk of fibrinogen by 4% polyethylene glycol (PEG-6000). Supernatant was brought to 12% PEG-6000 and the resulting pellet was re-suspended in 1/10 of the initial PPP volume in 20 mM sodium phosphate, pH 6.0. Alpha2M was adsorbed onto iminodiacetic acid-Sepharose column (25 × 160 mm, 3 mL/min) saturated by 50 mM zinc acetate then eluted with 0.1 M EDTA pH 8.0. Following concentration by ultrafiltration (Amicon Ultra-15 100K, Merck KGaA), α2M was further purified by gel filtration on Superose 6B column (16 × 500 mm, 1 mL/min). Purified α2M was concentrated by ultrafiltration up to 15 mg/mL estimated by immunonephelometry (BN II, Siemens). GDFXa-α2M was formed by incubating GDFXa (2 µM) with α2M (8 µM) for 20 minutes at 37°C in TBS containing 5 mM MnCl2. Preparations were kept at 4°C until use. 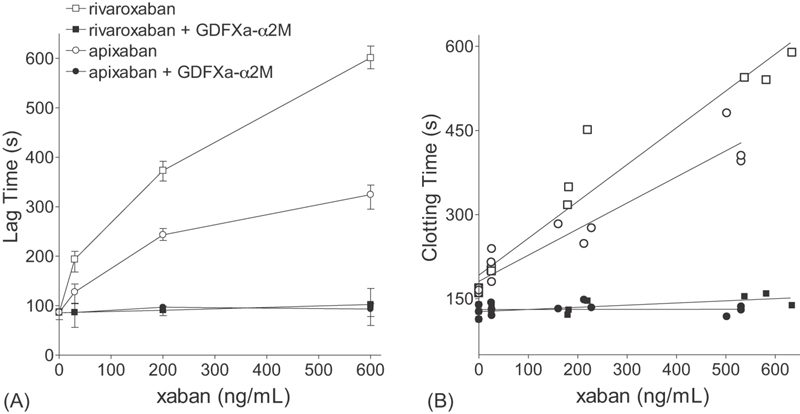 Complete sequestration of GDFXa by α2M was controlled by comparing velocity of S2765 hydrolysis in the presence or absence of 2.6 µM antithrombin and 1 IU anti-Xa/mL enoxaparin. Active site concentration of GDFXa-α2M was verified by titration with DEGRck. GDFXa (0.5 µM) free or fully sequestered by α2M were incubated with various DEGRck dilutions prepared immediately before use. Following 30 minutes of incubation at 37°C, residual activities were measured after a 1/20 dilution using S2765. The reported amount of GDFXa-α2M refers to the concentration of active GDFXa sequestered. Inhibition constants (KI ) of apixaban and rivaroxaban for GDFXa-α2M were determined as previously described. Apparent values were corrected for the S2765 competition by taking into account its Michaelis constant for GDFXa-α2M (60.3 ± 4.4 µM) estimated as previously reported for FXa. For reference purpose, a small amount of purified α2M was activated into the fast form by incubation with 200 mM methylamine (2 hours at room temperature) followed by extensive dialysis. Native α2M, GDFXa-α2M, and methylamine-treated α2M were analysed by native polyacrylamide gel electrophoresis (Invitrogen NuPAGE 3–8% Tris-Acetate Gel, Thermo Fisher Scientific, France). The kinetic of fibrin polymerization (clot waveform) was recorded by measuring A405 every 8 seconds at 37°C on a Tecan Infinite M200 Pro reader. Coagulation was initiated in 80 µL PPP containing 5 pM TF and 4 µM phospholipid vesicles by adding 20 µL 4-(2-hydroxyethyl)-1-piperazineethanesulfonic acid 50 mM pH 7.35 containing 60 mg/mL bovine serum albumin and 100 mM CaCl2. Data were normalized and the lag time of clot formation was defined as the time needed to reach 15% of the maximum turbidity measured through A405. Rotational thromboelastometry was performed on a ROTEM delta (Werfen, Baden-Dättwil, Switzerland). Coagulation was initiated through addition of 300 µL pre-warmed whole blood containing or not containing xaban and/or GDFXa-α2M to 40 µL triggering solution ensuring final concentrations of 2.5 pM TF, 10 µM phospholipid vesicles and 20 mM CaCl2. Reported clotting times are as defined by the manufacturer. Whole blood and PPP were spiked (1/20; v/v) with TBS containing 1% DMSO and the xaban as required. C57Bl/6JRj male mice (25–30 g) were purchased from Janvier Labs (Le Genest-Saint-Isle, France) and all assays performed at the Animal Platform, CRP2–UMS 3612 CNRS – US25 Inserm-IRD (Université Paris Descartes). Mice were anaesthetized by intra-peritoneal injection of a ketamine (80 mg/kg) and xylazine (16 mg/kg) mixture and were euthanized by cervical dislocation. All animal experiments were approved by the Ethic Committee on Animal Resources of Université Paris Descartes (registration number 201506151109793–V5 APAFiS #2677). Half-life of GDFXa-α2M was evaluated after a single 100 µL retro-orbital plexus injection of 150 nM GDFXa-α2M (0.34 mg/kg). Following tail vein transection (see below), 25 µL of blood were collected through challenges at timed intervals and immediately diluted at 1/5 in TBS containing 5 mM EDTA. Residual activity was evaluated in PPP after centrifugation (1,500 × g, 10 minutes, 20°C), by measuring rate of S2765 hydrolysis. Data were normalized with respect to hydrolysis measured in the sample collected 1 minute post-injection. The dependence of the normalized rate of hydrolysis on time was analysed by non-linear regression analysis using a single exponential decay equation to estimate the in vivo half-life of GDFXa-α2M. Persistence of GDFXa-α2M in blood was evaluated through 100 µL injection in each retro-orbital plexus of 3.6 µM GDFXa-α2M (17 mg/kg). Blood was collected in 0.11 M buffered trisodium citrate (9/1; v/v) by cardiac puncture at different time points (1–6 hours post-injection). Residual GDFXa-α2M activity was evaluated by measuring the rate of S2765 hydrolysis, as above. Mouse bleeding model was adapted from published method. Mice were force-fed with 10 mM HCl containing or not 50 mg/kg rivaroxaban. Two hours later, 100 µL GDFXa-α2M (3.6 µM) or its vehicle were injected in each retro-orbital plexus. Mouse tail was soaked in a mixture of NaCl (0.15 M) and EDTA (2 mM) at 37°C. Mouse was positioned on its right side and tail introduced in a homemade device enabling positioning at precisely its 2.5-mm diameter section. Using a mechanical linear guide, the left lateral tail vein was transected by a 0.5-mm deep incision. Mouse tail was replaced into soaking mixture and initial bleeding time monitored. Fifteen, 30, and 45 minutes post-injury, wound was challenged by gently wiping it twice with a 37°C saline-wetted gauze swab in the distal direction. Following each challenge, mouse tail was placed into a new collection tube containing the soaking mixture and re-bleeding was monitored. Red blood cells in each collection tube were collected (1,500 × g, 10 minutes, 20°C) and lysed in 20 mM Tris pH 7.5. A416 was transcribed into microlitre blood loss in reference to a titration curve. Secondary bleeding time and blood loss were defined as the sum of bleeding time and blood loss following the three challenges. GDFXa-α2M (3.6 µM) or its vehicle were injected in each retro-orbital plexus and blood collected 30 minutes later by cardiac puncture, as above. Pro-thrombotic potential of GDFXa-α2M was evaluated by clot waveform assay as described above. D-dimers and thrombin–antithrombin complexes (TAT) were measured by enzyme-linked immunosorbent assay (ELISA) according to the manufacturer's instructions using Mouse D-Dimers (D2D) ELISA Kit (Cusabio, anticorps-enligne.fr) and TAT complexes Mouse ELISA Kit (Abcam, Paris, France), respectively. All statistical analyses were computed using the GraphPad Prizm software. Half-life and KI values were expressed as mean ± standard deviation of three determinations. Coefficients of determination (R 2) were given by linear or non-linear regression analyses. Clotting time, lag time ratio, bleeding time and blood loss values were compared all together by Kruskal–Wallis test followed by Dunn tests performed for pair-wise comparisons. Vehicle versus antidote, D-dimers and TAT values were compared by unpaired two-tailed Mann–Whitney test. Statistical significance was accepted for p-value of < 0.05. Purified human α2M appeared homogeneous by native polyacrylamide gel electrophoresis analysis ([Fig. 1A]). Following incubation with GDFXa, the main species detectable migrated faster than native α2M suggesting that in spite of the molar excess of α2M over GDFXa most α2M had been activated to the fast form. Importantly, complete GDFXa sequestration by α2M was achieved since hydrolysis of S2765 by GDFXa-α2M was indistinguishable whether or not a mixture of 2.6 µM antithrombin and 1 IU anti-Xa/mL enoxaparin was added ([Fig. 1B]). On the contrary, rate of S2765 hydrolysis by GDFXa alone was fully inhibited by the antithrombin enoxaparin mixture. The same was true when enoxaparin was substituted with 1.4 mg/mL fondaparinux. We also verified that GDFXa-α2M resisted TFPI inhibition: TFPI completely inhibited GDFXa but had no effect on GDFXa-α2M amidolytic activity ([Fig. 1C]). Active site titration confirmed that GDFXa fully sequestered by α2M remains active albeit with a lower catalytic activity than that of free GDFXa ([Fig. 1D]). Therefore, all reported concentrations of GDFXa-α2M reflect the active site concentration of GDFXa within the complex and not total amount of α2M. Adding 1 µM purified α2M to PPP had no detectable effect on clot waveform assay ([Fig. 2A]). On the contrary, active GDFXa dose-dependently decreased the lag time, thus had pro-coagulant potential ([Fig. 2B]). It was therefore of upmost importance to avoid any traces of free GDFXa. Reproducible and satisfactory results were obtained by incubating α2M with GDFXa at a 4/1 stoichiometric ratio. The inhibition constants (KI ) of apixaban and rivaroxaban for GDFXa-α2M were slightly higher than those we recently reported for FXa in strictly identical conditions (KI = 2.41 ± 0.22 nM [R 2 = 0.84] vs. 0.74 ± 0.03 nM and 1.29 ± 0.13 nM [R 2 = 0.87] vs. 0.47 ± 0.02 nM, respectively; [Fig. 2C]). Above all, the preparation of GDFXa-α2M was devoid of pro- or anticoagulant activity as attested by clot waveform assay performed in PPP whether or not containing 1.7 µM GDFXa-α2M. Fig. 1 Preparation of Gla-domainless FXa α2-macroglobulin complex (GDFXa-α2M). (A) Native polyacrylamide gel electrophoresis (PAGE) (gradient 3–8%): lane 1, GDFXa only (invisible in this gel system); lane 2, purified native α2M; lane 3, GDFXa-α2M complex; lane 4, fast form of α2M (methylamine-treated). In spite of the 4/1 stoichiometric ratio, most if not all native α2M shifted towards the fast form upon incubation with GDFXa. (B and C) Progress of S2765 hydrolysis by 1 nM GDFXa (closed circles) or GDFXa-α2M (closed squares). Corresponding open symbols in B were obtained in the presence of 2.6 µM antithrombin and 1 IU anti-Xa/mL enoxaparin; corresponding open symbols in C were obtained in the presence of 145 nM tissue factor pathway inhibitor (TFPI). In both cases, GDFXa was fully inhibited, whereas GDFXa-α2M was unaffected. (D) Active site titration of GDFXa (open squares) and GDFXa-α2M (closed squares) by 1,5 Dansyl-Glu-Gly-Arg chloromethyl ketone (DEGRck). 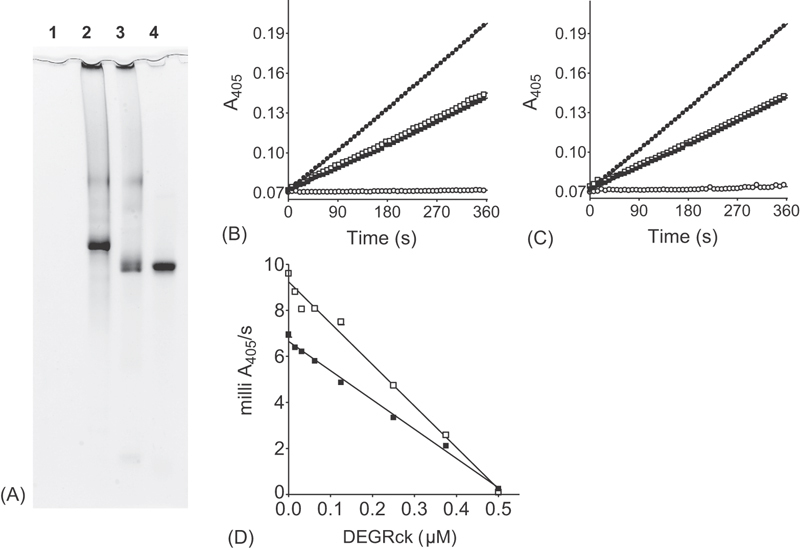 GDFXa or GDFXa-α2M (0.5 µM) were incubated 30 minutes at 37°C with DEGRck at the indicated concentration and the residual catalytic activity was measured after 1/20 dilution using S2765. GDFXa cleaved 1.4-fold faster S2765 than GDFXa-α2M. Fig. 2 Characterization of Gla-domainless FXa α2-macroglobulin complex (GDFXa-α2M). (A) Clot waveform triggered by adding 5 pM tissue factor (TF) and 4 µM phospholipid vesicles to platelet-poor plasma (PPP) (closed squares), containing 1 µM purified α2M (open circles) or 1.7 µM GDFXa-α2M (closed diamonds). Graph represents the A405 versus time (mean values ± standard error of the means [SEM] of 6 experiments). Lag time was defined as the time to reach 15% of the maximum. (B) Clot waveform triggered by adding 5 pM TF and 4 µM phospholipid vesicles to PPP alone (squares) or containing increasing amounts of GDFXa: 31.2 nM (circles), 62.5 nM (diamonds), 125 nM (upward triangles) and 250 nM (downward triangles). GDFXa was a potent pro-coagulant. 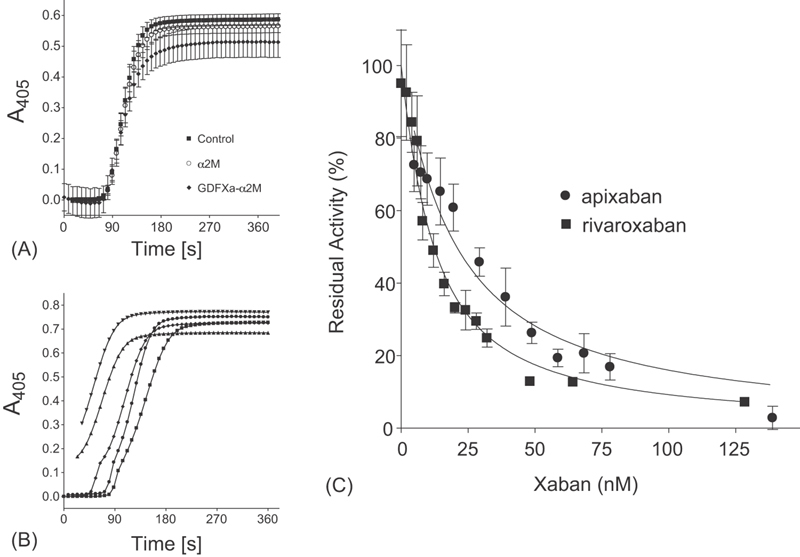 (C) Graph represents the residual rate of 400 µM S2765 hydrolysis by 5 nM GDFXa-α2M as a function of rivaroxaban (closed squares) or apixaban (closed circles); mean value ± SEM of three determinations. Solid lines were obtained by non-linear regression analysis using the tight-binding inhibition equation. Values of 2.41 ± 0.22 nM (R 2 = 0.84) and 1.29 ± 0.13 nM (R 2 = 0.87) were obtained for apixaban and rivaroxaban, respectively. We used clot waveform assay as a coagulation-based assay allowing detection of as little as 5 to 10 ng/mL xaban in PPP. To evaluate xaban neutralization by GDFXa-α2M, we triggered clot waveform assays in PPP spiked with increasing amount of xabans in the presence or absence of 1.7 µM GDFXa-α2M. Apixaban or rivaroxaban dose-dependently prolonged the lag time. GDFXa-α2M fully neutralized xaban anticoagulant effect even at supra-therapeutic levels. Indeed, lag times in the presence of GDFXa-α2M were comparable to control, irrespective of the xaban concentration ([Fig. 3A]). Fig. 3 Neutralization of xabans in vitro. (A) Graph represents the lag time of clot waveform triggered by adding 5 pM tissue factor (TF) and 4 µM phospholipid vesicles. Platelet-poor plasma (PPP) was spiked with increasing amounts (as indicated in the abscissa) of rivaroxaban (open squares) or apixaban (open circles). Corresponding closed symbols were obtained in these PPP containing in addition 1.7 µM Gla-domainless FXa α2-macroglobulin complex (GDFXa-α2M). Solid lines link the mean value of three determinations (error bars min and max). (B) Graph represents the clotting time (CT in seconds) of rotational thromboelastometry assays triggered by adding 2.5 pM TF and 10 µM phospholipid vesicles to blood spiked with rivaroxaban (squares) or apixaban (circles) and containing or not 1.7 µM GDFXa-α2M (closed or open symbols, respectively). Xaban concentrations indicated in the abscissa are the actual concentrations measured in PPP by anti-Xa activity. Solid lines were obtained by linear regression analysis. Overall, 1.7 µM GDFXa-α2M fully neutralized supra-therapeutic amounts of xaban (600 ng/mL) without affecting (in their absence) the lag time in PPP or the clotting time in the whole blood. ROTEM triggered by low TF is a whole blood coagulation-based assay potentially allowing xaban detection. Apixaban or rivaroxaban dose-dependently prolonged the clotting time. Adding 1.7 µM GDFXa-α2M fully reversed xaban anticoagulant effect: the clotting times were comparable to those obtained in the absence of xaban, irrespective of the drug concentration of up to 600 ng/mL ([Fig. 3B]). Overall, GDFXa-α2M neutralized supra-therapeutic amounts of apixaban and rivaroxaban in blood and PPP, whereas it was without effect in the absence of xabans. The reported half-life of FXa-α2M in mice is 2 minutes and that of subtilisin-α2M in rats is 6 minutes. In accord with these data, we estimated a half-life of 4.9 ± 1.1 minutes (R 2 = 0.90; [Fig. 4A]) after injection of 10 µg/mice GDFXa-α2M. However, uptake of protease-α2M is saturable. Thus, we evaluated the actual persistence of GDFXa-α2M following injection at the high dose needed for stoichiometric xaban neutralization. When 0.5 mg/mice GDFXa-α2M was injected, 50% of the catalytic activity of GDFXa-α2M was still detectable 170 minutes following injection ([Fig. 4B]). Consequently, we designed the in vivo experiments taking into account the actual persistence of GDFXa-α2M in mice. Fig. 4 Half-life and persistence of Gla-domainless FXa α2-macroglobulin complex (GDFXa-α2M) in mice. (A) Kinetic of the normalized residual rate of S2765 hydrolysis when 100 µL GDFXa-α2M (150 nM) was injected in mice. Data points are mean value of three determinations (error bars min and max). Solid line was obtained by nonlinear regression analysis using a single exponential decay equation. Estimated half-life of GDFXa-α2M in mice was 4.9 ± 1.1 minutes (R 2 = 0.90). (B) Kinetic of the normalized residual rate of S2765 hydrolysis when 100 µL GDFXa-α2M (3.6 µM) were injected in each retro-orbital plexus in mice. Data points are mean value of three determinations; solid line links the mean values (error bars min and max). Probably due to saturation of the uptake mechanisms, 50% of GDFXa-α2M catalytic activity persisted 170 minutes after injection. GDFXa-α2M efficacy for xaban neutralization was evaluated in vivo using a mouse bleeding model. Mice were force-fed with rivaroxaban or placebo and 2 hours later, vehicle or GDFXa-α2M (100 µL, 3.6 µM) were injected in each retro-orbital plexus. Primary endpoints were bleeding time and blood loss following lateral tail vein transection. Initial bleeding time and blood loss were comparable whether or not mice were force-fed with rivaroxaban (p > 0.05). However, following challenges, rivaroxaban increased secondary bleeding time (p < 0.001) as well as blood loss (p < 0.01), whereas both were comparable to placebo following GDFXa-α2M injection (p > 0.05). Overall, GDFXa-α2M significantly decreased rivaroxaban induced bleeding time (from 4.92 ± 1.0 to 2.84 ± 0.4 minutes; p < 0.001; [Fig. 5A]) and blood loss (from 351 ± 45 to 180 ± 87 µL; p < 0.01; [Fig. 5B]). In the absence of rivaroxaban, GDFXa-α2M had no effect on bleeding time (2.90 ± 0.28 vs. 2.95 ± 0.51 minutes; p > 0.05) and blood loss (158 ± 99 vs. 163 ± 73 µL; p > 0.05). We concluded that GDFXa-α2M effectively neutralized rivaroxaban anticoagulant effect in this in vivo model and that GDFXa-α2M alone had no adverse effect on mouse haemostasis. Fig. 5 Neutralization of rivaroxaban in mice. (A) Sum of secondary bleeding time (in minutes) following challenges at time 15, 30 and 45 minutes past initial tail vein transection. (B) Corresponding sum of secondary blood loss (in µL). Mice were force-fed with 10 mM HCl (open symbols) or rivaroxaban (closed symbols). Two hours later, 100 µL vehicle alone (circles) or containing 3.6 µM Gla-domainless FXa α2-macroglobulin complex (GDFXa-α2M) (squares) were injected in each retro-orbital plexus of the mice. Rivaroxaban significantly increased the bleeding time (p <0.001) and blood loss (p <0.01). This rivaroxaban-induced bleeding was significantly reduced by GDFXa-α2M both for the bleeding time (p <0.001) and blood loss (p <0.01) becoming non-significantly different from the control or GDFXa-α2M alone groups (p > 0.05). Drug/vehicle versus drug/antidote pair-wise comparisons estimated by Dunn tests (**p < 0.01; ***p < 0.001). The above data suggested that GDFXa-α2M was devoid of in vivo adverse effect. To exclude the potential pro-thrombotic effect of GDFXa-α2M in mice, we performed clot waveform assay in samples collected 30 minutes post-injection of vehicle or GDFXa-α2M. Whether or not mice received GDFXa-α2M, the lag time of clot waveform did not differ between groups (p = 0.18; [Fig. 6A]). Moreover, D-dimer and TAT levels were comparable (p = 0.50 and p = 0.13; [Fig. 6B] and [C]). Overall results suggested that GDFXa-α2M was devoid of pro- as well as anticoagulant properties in vivo. Fig. 6 Lack of Gla-domainless FXa α2-macroglobulin complex (GDFXa-α2M) pro-thrombotic potential in mice. Pro-thrombotic potential of GDFXa-α2M was evaluated in platelet-poor plasma (PPP) from mice injected with vehicle alone (open circles) or containing 3.6 µM GDFXa-α2M (closed circles). (A) Lag time (LT in seconds) of clot waveform. (B) Amount of D-dimers and (C) of thrombin–antithrombin (TAT) measured by enzyme-linked immunosorbent assay (ELISA). Determined by unpaired two-tailed Mann-Whitney test (vehicle vs. GDFXa-α2M) no significant difference was observed between lag times (p = 0.18), D-dimers (p = 0.50) or TAT (p = 0.13) suggesting a lack of pro-thrombotic potential in mice for GDFXa-α2M. Our goal was designing a neutralizing agent for xabans in vitro and in vivo. Our specification was that agent should neutralize xabans without otherwise affecting haemostasis. GDFXa-α2M was an attractive candidate because the active site of FXa within the complex would be preserved and bind xabans, whereas steric hindrance would prevent interaction with macromolecules (prothrombin, factor Va, antithrombin or TFPI). We herein documented that 1.7 µM GDFXa-α2M neutralized supra-therapeutic amounts of apixaban or rivaroxaban while devoid by itself of pro- or anticoagulant properties. Mouse tail vein transection is a pre-clinical model sensitive to pharmacological intervention in haemophilia A mice. We evaluated GDFXa-α2M efficacy as xabans neutralizing agent using this model. We confirmed as previously reported that oral administration of rivaroxaban produced variable initial blood loss. In contrast, secondary bleeding time and blood loss were significantly increased in mice treated with rivaroxaban alone, whereas in the groups having received in addition GDFXa-α2M, values were comparable to those of the control group. Presumably rivaroxaban binding to GDFXa-α2M neutralized its anticoagulant effect. That bleeding time and blood loss were comparable whether or not mice received GDFXa-α2M suggested harmlessness in addition to effectiveness. In accord with this hypothesis, neither D-dimer nor TAT levels increased following GDFXa-α2M injection. Ideally, an antidote should neutralize and eliminate its target in vivo rather than just sequestering it. Cleavage of the bait region in α2M exposes previously concealed recognition sites for receptors on fibroblasts, macrophages and hepatocytes that uptake α2M-protease from the circulation. Clearance is indistinguishable whether or not the active site of the α2M-linked protease is inhibited by low MW inhibitors. Assuming that such depletion occurs with GDFXa-α2M, it could literally deplete xaban from blood, bypassing the natural clearance mechanisms. On the other hand, we evidenced that high amount of GDFXa-α2M had a relatively long persistence in blood, presumably due to saturation of the uptake mechanisms. GDFXa-α2M would rapidly neutralize xabans but eliminate them only slowly. Accordingly, GDFXa-α2M may constitute a fairly long-lasting antidote not requiring continuous perfusion or multiple injections. It is worth mentioning that α2M and FXa are native blood components thus not immunogenic and that 1.7 µM GDFXa-α2M neutralizing supra-therapeutic levels of xabans is below the normal plasma concentration of α2M (3.5 µM in adults; 5.6 µM in newborn). Affinity of apixaban and rivaroxaban for GDFXa-α2M was just slightly less than that for FXa, supporting the hypothesis of stoichiometric interaction with the xabans. Thrombin generation assay is affected by xabans and thus would allow evaluating their neutralization. However, GDFXa-α2M ruined the thrombin generation assay because of its ability to cleave FluCa, precluding measurement of thrombin generation in its presence. Amount of GDFXa-α2M added to neutralize xabans (1.7 µM) actually exceeded the thrombin potential (1.3 µM). The prospect of using GDFXa-α2M as an antidote to xaban has limitations. First, it is difficult to consider α2M purified from human plasma for therapeutic use and large-scale production of recombinant α2M may turn out difficult. Second, our GDFXa-α2M preparation was a mixture of native α2M, and activated α2M having sequestered or not GDFXa. Adding micromolar quantities of native α2M to PPP had no detectable effect on blood coagulation. Blood readily contains large amounts of α2M which does not prevent xaban effects. We showed that active GDFXa is highly pro-coagulant and verified that GDFXa-α2M preparation did not contain traces of GDFXa. We also verified that GDFXa-α2M preparation itself was devoid of adverse effect in PPP (neither pro- nor anticoagulant). It can be concluded that sequestered GDFXa neutralized the xabans. We unexpectedly observed that partial neutralization of dabigatran as well as of heparin or its derivative occurs with activated forms of α2M such as methylamine-treated α2M in addition to GDFXa-α2M. Specifically, the catalytic activity of sequestered GDFXa is not affected by dabigatran, yet GDFXa-α2M partially neutralizes the anticoagulant effect of dabigatran. Mechanism likely involves secondary binding sites latent in native α2M. During blood coagulation, FXa-α2M and thrombin-α2M are formed. FXa-α2M formation with its 170 nM FXa potential is minor with respect to therapeutic xaban concentration. Again xabans are efficient coagulation inhibitors in spite of blood α2M content. Overall, GDFXa-α2M represented an in vitro and in vivo attractive neutralizing agent of xabans, neither pro- nor anticoagulant. Bleeding complications may occur with direct oral anticoagulants (DOACs) as with any anticoagulant drug. No antidote is yet approved for the DOAC targeting FXa (xabans). This is specially threatening in clinical scenarios such as massive haemorrhage, trauma, stroke requiring thrombolysis or urgent surgery. A complex between α2-macroglobulin and Gla-domainless FXa (GDFXa-α2M) is an attractive neutralizing agent of xabans in vitro and in vivo. GDFXa-α2M is effective as an antidote for rivaroxaban-induced bleeding in mice. GDFXa-α2M is devoid of pro-thrombotic potential in mice. I.G.-T. received honoraria for participating in expert meetings on apixaban (Bristol-Myers Squibb/Pfizer). P.G. received honoraria for participating in expert meetings on enoxaparin (Sanofi) and together with I.G.-T. and V.S. on rivaroxaban (Bayer Healthcare AG). The other authors declare no conflict of interest. The authors thank the generous donators of the Conny-Maeva charitable foundation. They also thank N. Neveux (AP-HP Hôpital Cochin, Paris, France) for the specific dosage of α2M and K. Kamaleswaran together with F. Martin for excellent technical skills. B.L.B. conceived the study and together with G.J. designed and performed research, analysed data and wrote the manuscript; I.G.-T., V.S., S.G. and P.G. critically discussed the data, revised the manuscript and gave final approval.